No child attending the Paramount Farms Child Development Center will be able to bring anything for show-and-tell that trumps their amazing, new US Green Building Council and LEED certified facility. The San Joaquin Valley, California pre-school provides education to eighty or so offspring of the almond and pistachio growing-employees of Paramount Agricultural Companies. This year, those lucky students will gain smarts in one of the country’s first environmentally friendly pre-schools. The pre-school, designed by Designers Architects MSP (McDonald, Soutar and Paz) and operated by Childrens’ Creative Learning Centers, will keep them warm and cool, and more — all the while providing excess power to give back to the grid. Designers Architects MSP who specialize in public and private educational facilities, seem to have thought of everything . . . and then some. 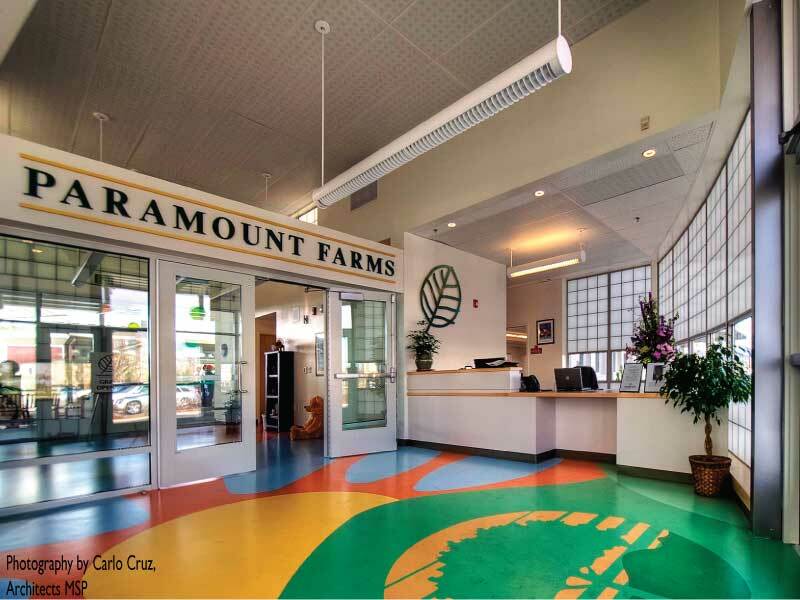 The Paramount Farms all-inclusive, sustainable kiddie mecca features temperature control via over-head chilled beams and hydronic heating in the floors — all noise-free and gentle, as well as energy generated through a roof mounted solar photovoltaic system. Recycled steel was used to construct the wall and roof framing in the eco-friendly pre-school, and T5 light fixtures with electronic ballasts are controlled by occupancy and daylight sensors to dim and turn off — just in case the last one out forgets to flip the switch. Water conservation is maintained via drip irrigation for the grounds, 1.5 gallon flush toilets and waterless urinals (so less water is wasted on bathroom breaks) and natural rubber floors made from recycled materials are used in play areas both inside and out. The pre-school teachers have high visibility of students via carefully designed low walls, and both students and teachers will enjoy indoor and outdoor “learning spaces.” And keeping with the Paramount Farms business, the grounds are landscaped with extra almond and pistachio trees the students’ parents have lovingly tended — even better, the nuts can in turn be consumed by the kids. Ladies and gentlemen, and students of Paramount Farms Child Development Center, this is the circle of life, experienced first hand. 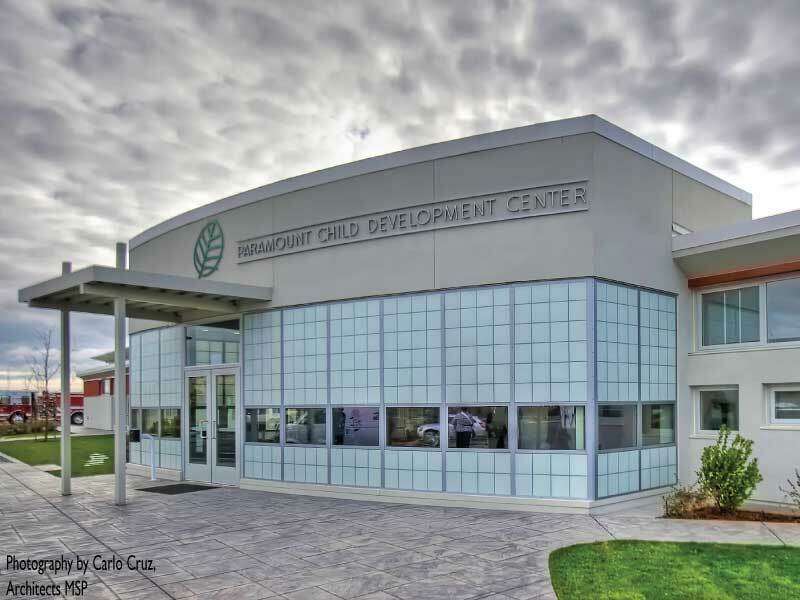 No child attending the Paramount Farms Child Development Center will be able to bring anything for show-and-tell that trumps their amazing, new US Green Building Council and LEED certified facility. The San Joaquin Valley, California pre-school provides education to eighty or so offspring of the almond and pistachio growing-employees of Paramount Agricultural Companies. This year, those lucky students will gain smarts� in one of the country's first environmentally friendly pre-schools. The pre-school, designed by Designers Architects MSP (McDonald, Soutar and Paz) and operated by Childrens' Creative Learning Centers, will keep them warm and cool, and more -- all the while providing excess power to give back to the grid.